Wiltons are able to supply a wide range of Designs or Produce a one-off bespoke fireplace for your Home, Office, Hotel, Swimming Pool Complex or wherever you would like a fire – as long as it complies with Building Regulations! Before you choose a fireplace style it is important to make sure your chimney, if you have one, is up to the task, we can line your chimney or offer an alternate solution if needed. Certain fires will require wall vents, so it is important to have all the facts before you make any decisions. We offer a range of services including the restoration of existing marble, stone and cast iron surrounds. Original inserts or baskets or cast iron combinations can also be restored to their former glory as well as being highlight polished to give them an extra effect. Cast Iron or Steel, Traditional or Modern for use with gas (natural and lpg) or solid fuel (wood or coal/coke). Always make sure that you have the correct sized flue or chimney system for the type of Stove you desire. For wood burning depending on the specification on the stove, flue sizes start at 5" but that is for Defra approved products only. For any wood/solid fuel stove not defra approved or with a high output you will need a larger diameter flue liner or chimney system and a wall vent. Solid fuel stoves can be either top or rear exit depending on the stove. For gas variants there is conventional flue as well as balanced flue systems and the gas variants have a remote control system for starting, turning off and adjusting the temperature. Some system can be set to maintain a room temperature and will modulate accordingly and others can be programmed to turn on and off at certain times. Where there are flue issues there are fan systems that can be used and flueless products are also available, if all else fails you can always go for an electric variant. Typically gas high efficiency hole in the wall balanced flue fireplaces have become very popular with single front, double sided and even triple sided fires. The fires only require a balanced flue which means that if you do not have a chimney, the system can vent through an outside wall, or they can run with a flue liner up a conventional chimney. These fires are very efficient and convenient to use. They are remote controlled for all their operations. 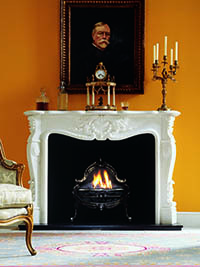 Of the fires shown here the fire with the granite surround is flueless, as in has no chimney and does not vent through an outside wall. With these type of fires the maximum heat output is under 4kw but require a wall vent to comply with Building and Gas Safe Regulations. The fire with the Travertine surround is a balanced flue fire and you can see it has a much more powerful flame pattern. There are various sizes and shapes to these modern fires which mean they can fit pretty much anywhere and the square units looks superb within a Traditional surround offering the timeless beauty of a surround with ultra modern heat efficiency. The square type units also have brick effect backs and logs to complete the effect. We supply stone surrounds for all styles and tastes, from a simple modern design to an Art Deco style, Edwardian, Victorian, Georgian or Tudor. 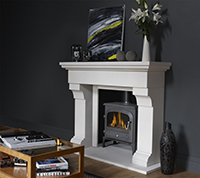 We can supply the surround on its own or with a matching hearth, back hearth and slips, as required. We can also supply baskets and inserts to go inside the surround, as well as stoves or modern high efficiency glass fronted fires.Most of our baskets and inserts are suitable for either solid fuel or gas. With the gas variants the fire can be remote controlled. If there are flue issues we can design a fan system to make sure you get the fireplace that you want. We offer Louis XV and XVI styled Surrounds in stone with their beautiful hand carved and intricate features. The Louis XV surround shown here with a basket also looks superb with an insert or even a modern glass fronted high efficiency balanced flue fireplace. Our experience will enable you to choose the fireplace(s) that you have always wanted. Listening is all part of the process and it is our job to guide you to the right choice after running through the options that are available to you. With modern technology if you do not have a chimney or an outside wall where you want to flue out there are additional systems that will help you such as fans or flueless technology or even electric versions. We know what is available and look forward to helping you.